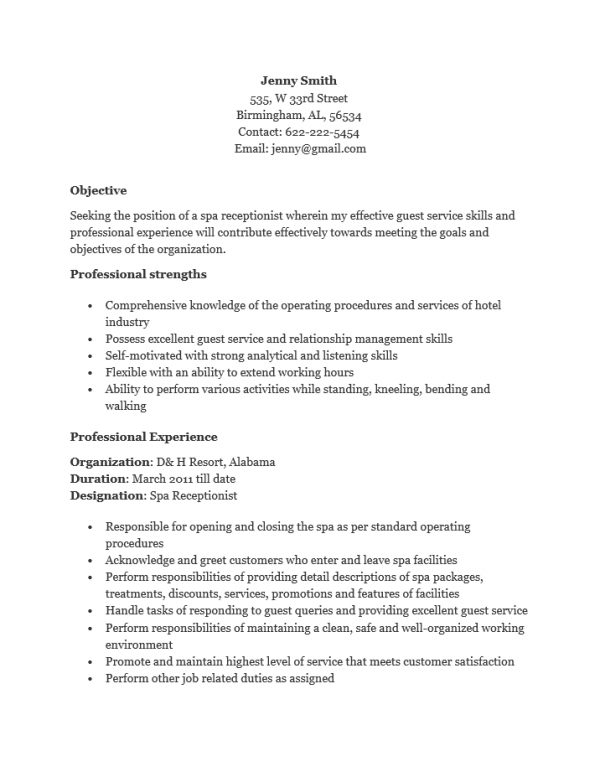 The Spa Receptionist Resume Template grants efficiency to job seekers engaged in a search for the perfect employment opportunity. Job hunters will need to prepare themselves to represent themselves in being proficient at gate keeping, giving tours, appointment setting, switchboard management, delivering messages in a very timely fashion, and maintaining a calm relaxing manner while retaining control of the reception area. These are a few of the requirements that a spa receptionist must meet. Spas are a very specific setting however these businesses can be found everywhere from hotels to gyms and can operate independently as a store front. This means that a variety of opportunities await those who can handle this position and wish to pursue an opportunity in the field of spa reception. Generally speaking a resume template fulfills two functions for job seekers wishing to create a document. The primary use is to give a framework for one to create his or her resume. The headings will aid a job seeker in organizing and presenting content regarding his or her experience and qualifications. The second is that once a resume has been created it can easily be revised on the fly to customize for a potential employer. This is easily accomplished by simply copying and pasting the parts of the original resume onto a new template and adding content specific to the opportunity. It is no secret that a customized resume specifically mentioning a hiring entities organization will gain very positive attention…especially if the content is well thought out and smartly written. Step 1. Name and Contact Information: This is located at the top of the page and should be similar to a business card where it will display the candidate’s full name in a prominent manner. Step 2. Career Objective: This section will display the candidate’s intentions to obtain the position in no uncertain terms and deliver a highlight of their skills. It is usually one to three short statements. Step 3. Professional Strengths: Every job seeker has skills or a knowledge base to draw from. This is the section where these will be displayed. It should be straightforward and to the point and in a bullet list format. Step 4. Professional Experience: This is where an applicant lists his or her employment history. This template will deliver sub-headings for the basic (and mandatory) information that must be presented. Below these sub-headings should be a synopsis of the time spent working for a specific employer. This list (as a whole) should be organized in reverse chronological order according to the dates worked. Step 5. Educational Summary: This is where a candidate lists his or her academic credentials. Step 6. References: Candidates have a choice of obtaining permission from their references to list his/her contact information directly on the resume or simply state that references are available. If one has no professional or personal references then this section should be omitted.